Home About Universe Alien stars Aliens Astrobiology Astronomy Beginners Black holes Hubble Missions NASA Scientists Space Exploration NASA Mystery: Brilliant Flash From Deep Space Baffles Astronomers --"Unlike Any Ever Seen Before"
NASA Mystery: Brilliant Flash From Deep Space Baffles Astronomers --"Unlike Any Ever Seen Before"
NASA has reported a catastrophic event is taking place in space, but scientists are still investigating what exactly has happened or happening. Mysterious flashes of X-rays beamed towards Earth before vanishing just 24 hours later, leaving scientists to investigate the source. Initial findings suggest it came from a "completely new type of cataclysmic event". The phenomenon was captured by NASA's Chandra X-ray Observatory, stemmed from a galaxy 10.7 billion light years away. 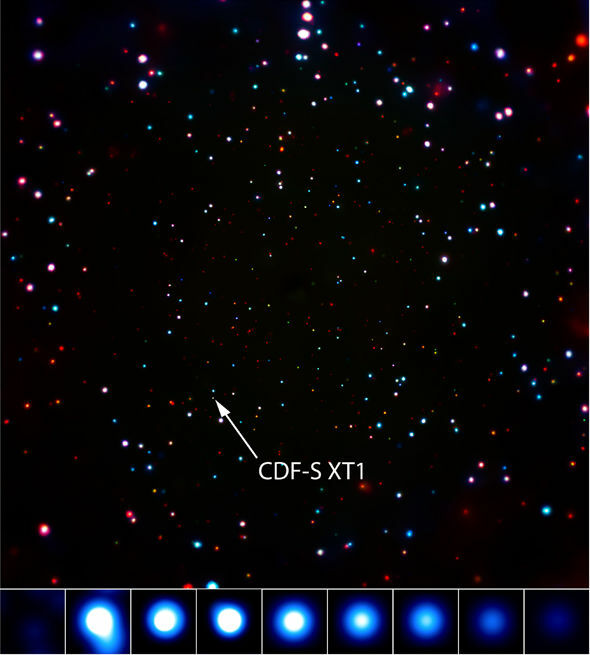 The X-ray source, is located in the sky known as Chandra Deep Field-South (CDF-S). A NASA spokesman said: “A mysterious flash of X-rays has been discovered by NASA’s Chandra X-ray Observatory in the deepest X-ray image ever obtained. This source likely comes from some sort of destructive event in space, but may be of a variety that scientists have never seen before." This source was not detected in X-rays before October 2014, but then it became a factor of 1,000 brighter in a few hours. After a day the source had gone completely and Chandra was no more able to detect it. It took thousands of hours to fetch data from the Hubble and Spitzer Space Telescopes helped determine that the event likely came from a faint’s small galaxy about 10.7 billion lightyears from Earth. There are some possibilities which explain the X-ray source raise gamma-ray burst (GRB) events. After the collapse of a massive star or when a neutron star merge with another neutron star or black hole GRBs explode. 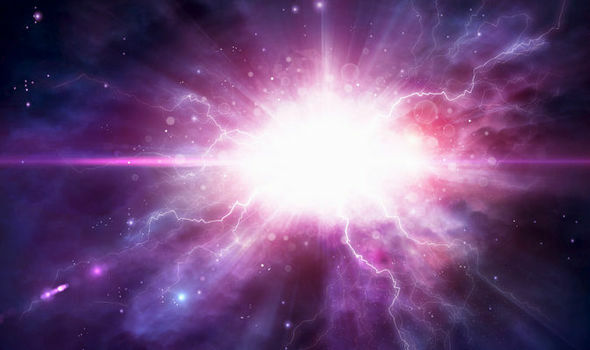 The only possibility of detecting the gamma rays is when that gamma burst explosion has the direction towards earth. Some heavy amount of energy emits in this process, isotropic radiation at X-ray and other wavelengths. A still Image of CDF-S transient. Possible explanations for the CDF-S X-ray source, are that it was not pointing towards earth. A third possibility is that a medium-sized black hole swallowed a white dwarf star. This is the very first time in nearly past 17 years that Chandra has observed the mysterious X-ray source in the CDF-S region and in any other part of the sky. If the X-ray source was caused by a GRB triggered by the merger of a neutron star with a black hole or another neutron star, then gravitational waves would also have been produced. If such an event were to occur much closer to Earth, within a few hundred million light years, it may be detectable with the Laser Interferometer Gravitational-Wave Observatory (LIGO). A paper describing this result appears in the June 2017 issue of the Monthly Notices of the Royal Astronomical Society and is available online.